"I am a nine year old third grader and made up this recipe with a little help from mom. It is really good with a thin layer of peanut butter spread on it. I hope you enjoy it!" To bake bread in oven: select dough or manual cycle. Once cycle is complete, shape dough and place in a greased loaf pan. Allow to rise in a warm spot until doubled in size. Bake in a preheated 350 degrees F (175 degrees C) oven for 35 to 45 minutes or until a thermometer inserted in the center of the loaf reads 200 degrees F (95 degrees C). I used only whole wheat flour for the flour, and all honey for the sweetener. 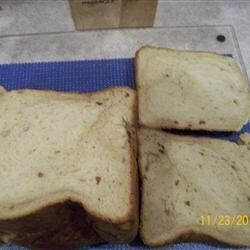 I increased the peanut butter by 1 T. This is a great bread, especially if you have some jelly!